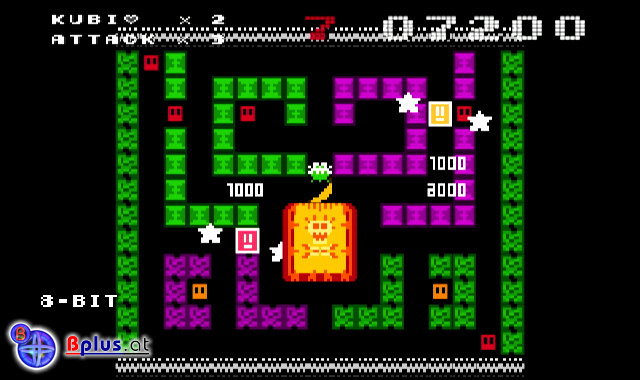 We've recently seen quite a bit of new information being released regarding Bplus' upcoming WiiWare release Bit Boy! !, but there were still a lot of unanswered questions floating around that needed some answers. We recently caught up with Bernd Geiblinger, Art Director at Bplus, and he was kind enough to sit down and answer some of our burning questions. You can find out what he had to say in the interview below. Nintendo Life: First off, how long has Bit Boy!! been in development? Bernd Geiblinger: You know, creating a game requires tons of graphics, sounds and code. Developing literally six of them simultaneously was an enormous challenge for Daniel and me. We worked day and night and put much love into Bit Boy!!. In the end we were able to stay in our tight time frame pretty well. 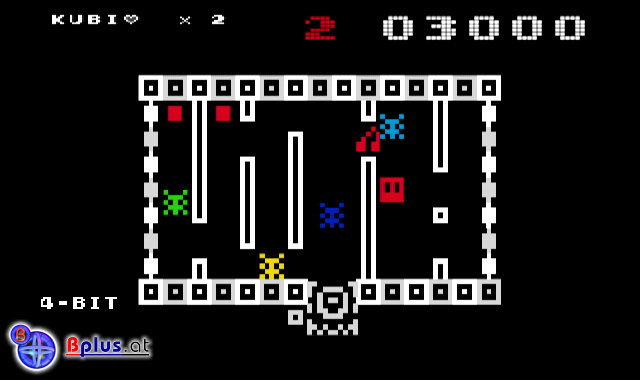 But let's put it in another way: The 4-bit version of Bit Boy! !, simply called 'Bit Boy', could have been released in 1975. 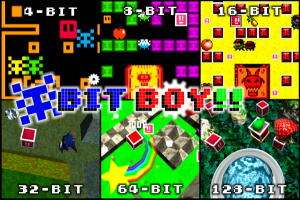 'Bit Boy 2' might have come out in 1984, with 'Super Bit Boy' following in 1992, 'Bit Boy 3D' in 1995, 'Bit Boy 64' in 1998 and finally 'Bit Boy Wii' in 2006. When viewed like that, Bit Boy!! has been in development for nearly 35 years – we just didn't know it until recently. NL: How did you come up with the idea for Bit Boy!! in the first place? BG: Since the announcement of the Virtual Console for Wii, we've dreamed of retro-style successors of the games we loved so much. When we came up with the idea to do a retro game ourselves, we were suddenly in the difficult position of deciding in which graphical style the game should be realised. We know that every true gamer has a special place in his/her heart for the style of the games they started with – and that's what Bit Boy!! is all about. We wanted the game to spark true retro feelings in all gamers, regardless of age, so we decided to send our one-pixel hero Kubi on a time journey through the whole history of video games. NL: Are there any specific classic video games that inspired you during development of Bit Boy!!? BG: Certainly, there are games in each generation that were absolutely outstanding and had a huge impact on all other titles of that gaming era. In the 4-bit era, we were inspired by games that were so big before the great videogame crash of 1984, released for consoles like Atari, Intellivision, ColecoVision. Of course we know that all of these consoles were technically 8-bit, but we wanted to give them a special part outside of the NES/Master System era. 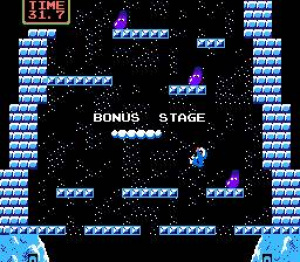 Inspirations for the 8-Bit era were the early NES games like Mario Bros., Ice Climber and Tetris. In 16-bit, we pay homage to Super Bomberman, The Legend of Zelda: A Link to the Past and Final Fantasy. The 32-bit section takes place in solid 3D dungeons that were heavily influenced by the semi-realistic, yet pixellated look of the original Tomb Raider. 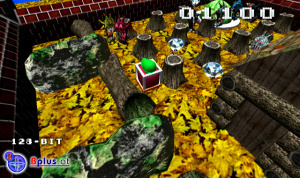 The 64-bit era is totally different than all others in terms of visuals, because it is presented in the cute and colourful look seen in Super Mario 64, Chameleon Twist, or Banjo-Kazooie. For the 128-bit era, we chose to use a rather realistic setting by using high resolution, photographed textures and some neat Wii graphic effects to bring the fantasy world with all of its dangerous monsters to life. NL: Was there one specific aspect of the game you were particularly focused on during development? BG: Our main goal when creating Bit Boy!! was to recreate the look and feel of all the classic generations as accurately as possible. We even went as far as to incorporate the exact NES palette into the 8-Bit era. Another focus was to make Bit Boy!! accessible to ALL gamers. Naturally, some very young gamers may not understand the passion 'older' players have for their favorites from the past. With Bit Boy!! featuring all of the different generations, everyone can experience and learn to love the feeling of retro gameplay. NL: Can you explain the actual gameplay of Bit Boy!! in some detail for our readers? BG: Bit Boy!! features classic, arcade-style gameplay. During his journey through time, Kubi visits increasingly complex dungeons that not only look, but play distinctively different thanks to varied level designs. As Bit Boy!! 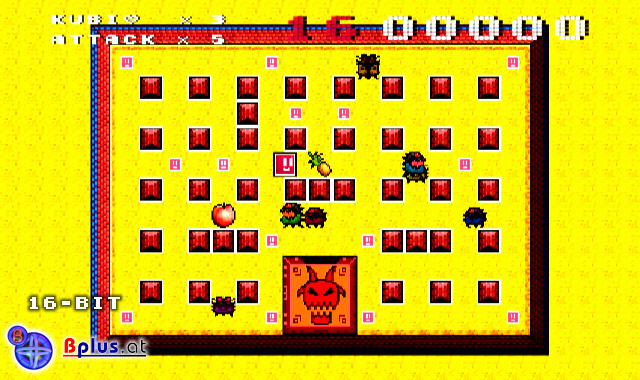 is a very old-school, arcade-style action game, your main aim is to get the ultimate high score by rescuing friends, eating fruit and defeating monsters that roam the levels. 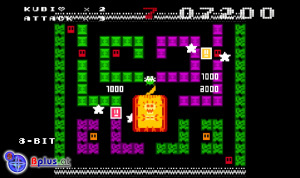 From the 8-bit era on, Kubi can use special attacks to defeat monsters and later in the game he gains the ability to jump onto objects to hide himself from enemies. They change tactics in each level, so be sure to use the limited number of attacks wisely. We intended that the Bit Generations are not too long, because we wanted to give everyone, even new gamers that generally lose interest quickly, the chance to unlock all of them. If you cannot wait to see the next generations, you can really rush through the game, but that way you will never see your name on the top of the high score tables. 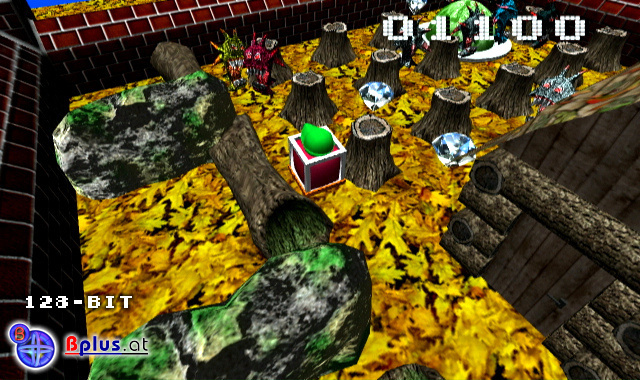 Finding out the right tactics for a super-duper score to can be really tough, you have to survive to collect all of the fruit and defeat as many monsters as possible. As a nice reward, the top score of each bit generation is displayed on the title screen, so try to get your name there! You can unlock the Warp Mode for every Bit Generation you complete. 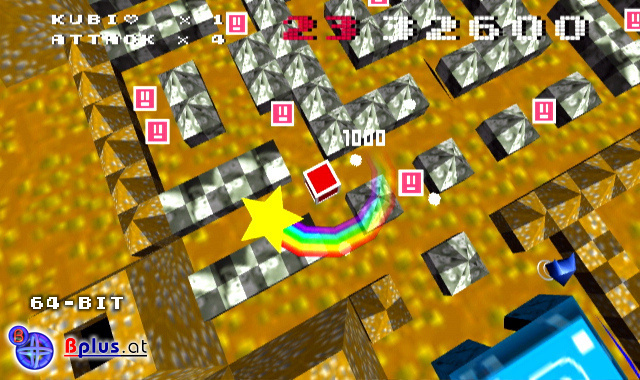 This is an endless mode where your main aim is to collect as many time diamonds as possible. When you bump into a monster, you just get warped to the next level! You can also play together with a friend and compete for the most time diamonds. When you finish the game, a special surprise awaits you. NL: Can you go into a bit more detail about how the changing bits effect the game in terms of visuals, sound, and gameplay? BG: While the main aim always stays the same, the feeling changes not only with every generation, but with every single level. 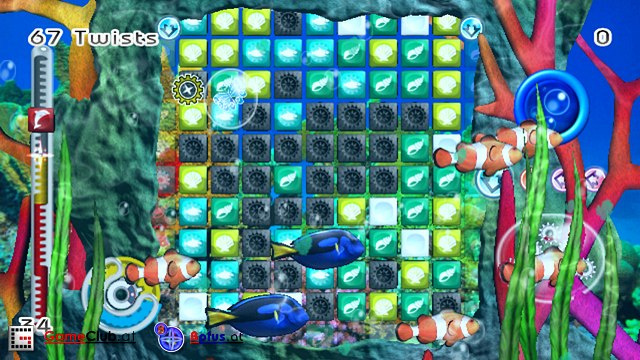 Each and every dungeon incorporates a special theme that is reflected in the way the level is designed. 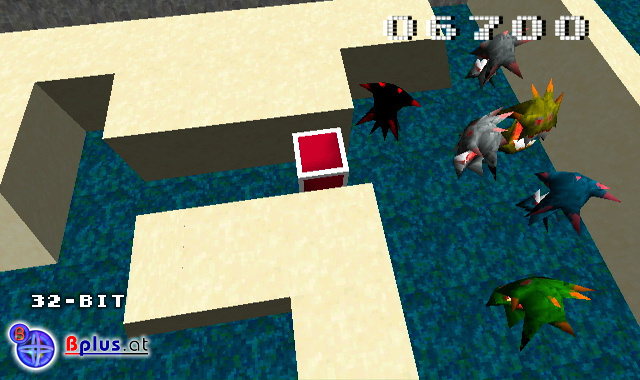 As mentioned before, Kubi also gains the ability to attack and to jump onto objects (or even over monsters) during the game, which adds much more depth to the experience. Of course, the visuals are different in every bit generation, changing from simple bunches of pixels to 2D sprites to lively 3D models, from blurry or pixellated textures to sharp photos and from simple shapes to very complex and detailed ones. Since we're so in love with retro sounds, we decided to beautify the whole game with beepy sounds and classic Game Boy-like chip tunes that get more complex and funky with each generation. BG: We put very much love and effort into the different bit generations and we are very proud that when you play Bit Boy!! 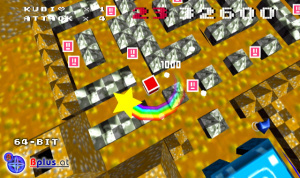 it really feels as if you're playing on the old consoles, completely forgetting about it being a WiiWare game. It was our main aim and I think we accomplished that quite nicely. NL: What controllers are supported in Bit Boy!!? BG: Choose between two modes: Classic +Control Pad Style, with the Wii Remote used like an NES controller and Retro Joystick Style, with the Wii Remote simulating a classic arcade joystick using the motion sensors. BG: Yes, of course! Every game includes many things that players aren’t aware of. Things like processing error messages, system configurations, initialising video and sound modes, dealing with controller input, home menu implementation, various calibrations, a lot of byte movement through main memory, accessing flash memory as well as reset and power functions cost many months of development time and there is no getting around them, because Nintendo is checking all these things very strictly. Thanks to our previous games, we now can reuse most of the procedures and basic engines, so we can put our focus on things that really matter, like fun and fan service. Now that we understand the Wii's internal workings better and our knowledge increases, we can make our ideas reality in a much better way. Of course, we always force ourselves to find new things to try out – create new engines and try what we can do that no company has done before – like the FlipControl in Vektor Tank and the 6-in-1 retro package you find in Bit Boy!!. NL: If you had to describe Bit Boy!! in one word, what word would that be? NL: Have you completed development of Bit Boy!! and when can we expect to see the game released in the various regions? BG: Currently, the lovable guys at Nintendo are checking every single bit of our game, so it could be released very soon. NL: Has a price been set for the game yet? BG: Yes, but it's ultimately Nintendo who have the last word on that. What we can say is that it will be well under 1000 Wii Points. NL: Do you currently have any other game titles under development at Bplus and could you possibly shed a bit of light on any of them? BG: There are some projects in early stages I cannot talk about yet – and there is of course Vektor Tank where our main focus currently lies. We are very committed to fan service and open-minded on hearing what you want to see in our games. I invite everyone to come over to our forum and share with us all the incredible things you want to see in our next game! We also have open ears for any gobsmacking 'thing' you might come up with for our upcoming Vektor Tank title. BG: We read nearly every single comment that is made from users about our games online. We cut a caper for every nice comment, are happy about every constructive critic and we are absolutely disappointed and sad every time we read a disrespectful bashing. NL: Bernd, as always, we thank you and Bplus for your time and candidness. BG: Thank you for the great questions and for the opportunity to share our thoughts on Bit Boy!! with your readers. Also, they seem pretty enthusiastic about this one. Maybe Bplus might actually get more than a D- this time. If Bplus is really only two guys I think we should all cut them a little more slack. I'm really looking forward to this game. 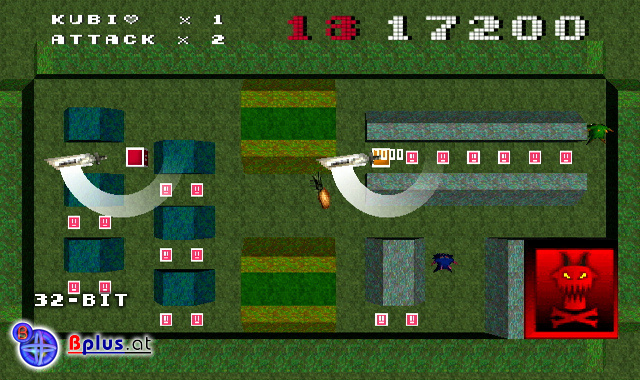 It looks like Bplus have really hit their stride on WiiWare now, this looks pretty damn cool. It's a great concept so I am looking forward to checking out the final product. I think it looks cool. I can't wait to try it out for real. Looks interesting. Niki Rock N Ball didn`t seize to impress me the slightest from ol B Plus so I'll be careful for this game. As for Corbie's interview on the other hand, great job! Buster: I don't think so. I don't care for Bernds PR sweet or tough guy talkies anymore. I've played Plättchen and Niki after the public release for a while on our Gamer Parties and in both cases it wasn't satisfying and worth the money. 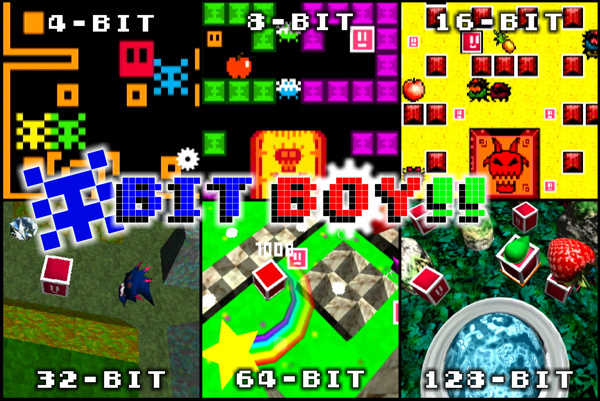 Bit Boy looks like a recycled concept of Pac-Man in just various generations of styles. Bernd/Daniel: Ever heard something about Doukutsu Monogatari/Cave Story? It will be released for WiiWare soon and I think you both should aim for that kind of retro-quality for your upcoming games. @ Buster13: "Did he say the Wii was only 128 bit? Corrtect me if I'm wrong, but I thought the FIRST and only 128-bit system was the Dreamcast." The GameCube, PS2 and Xbox were also 128-bit systems. So what generation of consoles were classed as 4-bit? I don't remember Atari 2600 being referred to in this way. Bernd even says in the interview that the Atari 2600, Intellivision, and Colecovision were technically 8-bit, but they classified them as 4-bit to differentiate them from the NES/Master system. So by the same token, would you consider MSX/Spectrum/Amstrad/C64 home computers as 8-bit, but too limited to be ranked alongside the mighty Master System and NES? Also was the PC Engine / TG16 8-bit or 16-bit? I know the fans still debate this! The PC Engine was an 8-bit console by definition. I know it got lumped in with the 16-bit generation, but it was nothing more than a souped-up 8-bitter. But it could run shooters like butter. As for those computers, they'd rank near the NES/Master System in quality in my eyes. Much more so than the Atari 2600 or Intellivision. Did you ever play on a ZX Spectrum? Once I upgraded to the Master System there was no going back, at the time it felt like having an arcade machine in your own home! Yes, I've used both a ZX Spectrum and a Commodore 64. But as you said, once we got the NES, there was not really much looking back. I rode the NES out through my high school years as the Master System didn't sell at all here in the states. It had like 5% of the market. : ) I bought a friend's Master System for R-Type and Phantasy Star, but I never bought another game for it. It wasn't until the 16-bit generation that I finally owned all three consoles. I got the Genesis for Christmas, the TG16 2 months later on my birthday, and then SNES the day it came out a year and a half later. I think Chatham is the biggest SMS fan I've encountered. In high school I had a good friend with an NES which I remember playing many rented games on during long weekend play sessions (Ikari warriors right up to the glitch-out unplayable ending; Bubble Bobble until we just couldn't beat it); he had a friend with an SMS. I saw Phantasy Star and Gradius, but wasn't really impressed compared with the NES which had a much larger library and better box art. I'm looking forward to this and I plan on downloading since it may be under 1,000 points. I'm definitely intrigued by this one. It's got a really cool gimmick and if it plays well, then I certainly imagine the replay value will be very high. Surprised he didn't mention Pacman in the interview...that's definitely the vibe I was getting from the trailer! Point taken Starwolf_UK and I hope that Bplus have found their stride with this title. BTW was that a dig at Mecho Wars in the last minute of that vid I heard? I love nothing more than supporting Indie developers, but when people give the old, "yeah but it's just two guys in their basement" argument, I usually think this: If two people in their basement can't make a good game, maybe they need to bring more people into the basement. You hearing this, Calculon? You're forcing them to cry themselves to sleep at night. 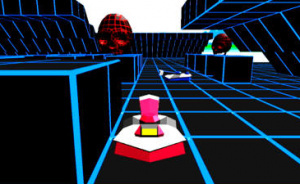 @ChickenBrutus: I thought it looks kinda like Pac Man / Crystal Castles, but ol' WiiBoy seems to disagree. @Gizmo #7: Really? You learn something new everyday. I had always thought that the PS2, GC, and Xbox were a tad more powerful than the Dreamcast, and by that point the bit count didn't really matter anymore. That's why I thought the Dreamcast was the only 128-bit system. Just to clear things up, the PS2 is a souped up 64 bit system, not 128..
@Braz-The PS2...was 128 and so was the GC. I still look forward to the reviews on this. If they are good, this just may be a purchase for me at some point. Right, the PS2 is a 128 bit system with a 64 bit processor... sure, whatever you say. @Brazcan. Why is it considered part of the 128-bit era then? I think they stopped officially counting after the 64-bit era. Also: I kinda agree with what people are saying about the 128-bit era. It certainly looks snazzy, but things like the floor effect just look a bit too overdone, and might get old faster than the other generations. Still, that doesn't mean the gameplay will be a let-down, and I'm still looking forward to giving this a whirl more than ever, now. People consider it part of the 128 bit era because they are ignorant and think that just because a system is released after another it's automatically more bits. Do some research before you post. @Corbie is (technically) right, after the Dreamcast, people stopped counting "bits", maybe it's because the video game companies ($ony, M$, Ninty) didn't want to have to waste time explaining how their system has a "smaller" processor but still produces better quality graphics than the Dreamcast because of the DVD format, graphics acceleration, etc. Or maybe they were afraid that if the public found out that they were selling a "weaker" system, they wouldn't sell as much. So they grouped all 6th generation falsely as "128 bit", just to feed the mob mentality (it's called marketing) and people, obviously, ate it up without asking any questions. Besides, it's not about the bits anymore, its about the graphics acceleration hardware (Nvidia, ATI, etc.) that makes todays systems super powerful, think of them as "mini-computers"... do you count the "bits" on your PC? No, you don't, you say what graphics card you have and how many Ghz is the processor. Very interesting idea for a game. I think I may not get it, but I'm not entirely ruling it out as a purchase. Ugh, this still sounds pretty lame. The fact that it's made by Bplus doesn't help either. Pass.